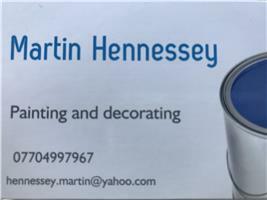 Martin Hennessey Painting & Decorating - Painter/Decorator based in Camberley, Surrey. My name is Martin Hennessy and I’ve been decorating 15 years. I pride myself on a high end bespoke finish, very tidy and organised and good friendly service. I’m based in Camberley but cover most of Surrey and surrounding areas. I take on most jobs big or small with a free quotation service.